The logistics of the canonization ceremony for Pope Paul VI, Archbishop Oscar Romero and others, have become clearer after the publication of instructions from the dioceses of Brescia (headquarters for Pope Montini’s cause) and San Salvador (for the Salvadoran martyr). According to the guidelines, the Vatican will allow the dioceses of origin to organize the attendance of their devotees, granting each one a block of entrance tickets to the ceremony to distribute to their groups of faithful; the Archdiocese of San Salvador will have 2,500 seats in an assigned area during the ceremony. 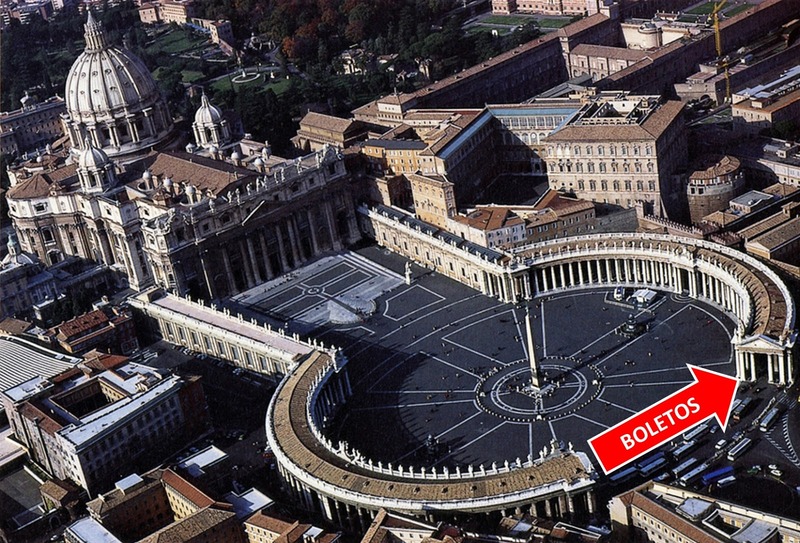 Large images of the seven new saints will decorate the façade of St. Peter's Basilica. 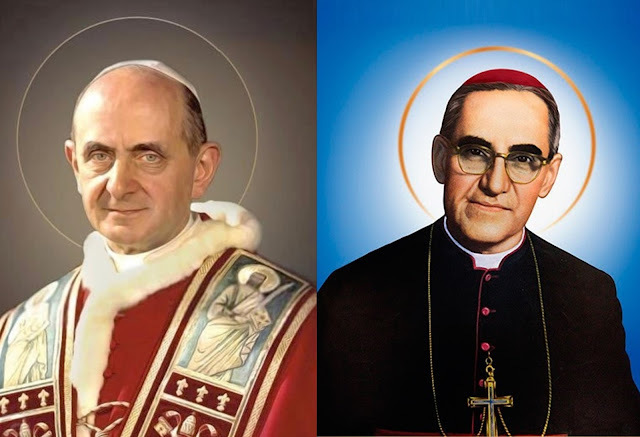 Paul VI and Archbishop Romero (photo) will occupy the central place, as they have done in the press; the Pope on the left, and the martyred archbishop on the right; the two surrounded by five more saints. 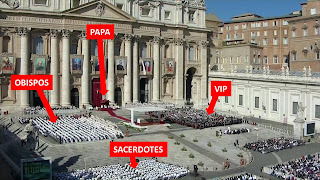 Salvadoran President Salvador Sanchez Ceren will attend the ceremony and will be seated in the VIP section, to the right of the papal altar. In the same area Cecilia Maribel Flores de Rivas and her family will also be seated—they are the beneficiaries of the miracle that made the canonization possible; also, Romero’s two surviving brothers and other relatives. The seating section on the left side will be reserved for bishops, including the entire Salvadoran bishops’ conference. The ceremony will take place during a synod of bishops, which means that many bishops from around the world will be present: the 2015 synod was attended by more than 250 bishops. If Romero’s canonization in Rome and not in El Salvador as his people wanted counts for something, it will be to sear the image of Romero in the minds of the world’s bishops gathered there. 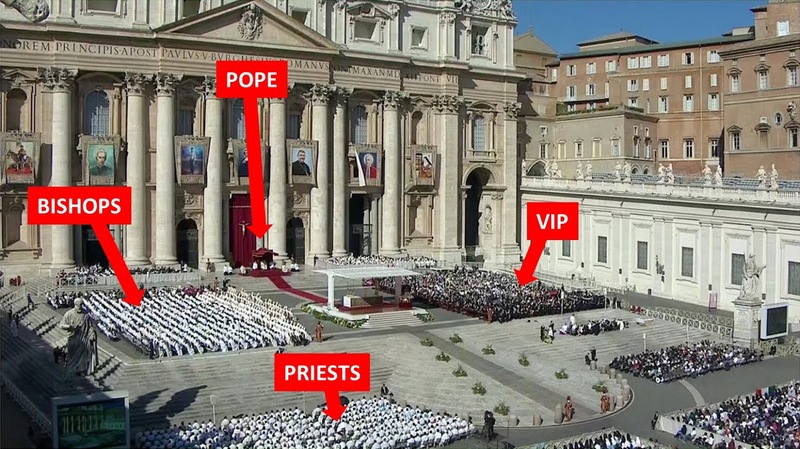 In front of the bishops, the front rows in St. Peter's Square will be designated for concelebrating priests, who will also be numerous. 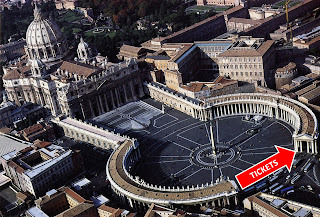 The tickets will be distributed to those registered (through group organizers) on the Saturday before the ceremony, between 3 and 6 in the afternoon, on the right side (seen from the front) of the Colonnade of St. Peter’s Square. With their tickets in hand, the pilgrims must appear on Sunday 14 at 7 in the morning to proceed to their designated places in an orderly fashion. During the ceremony, Romero will become the twelfth ever saint born in the Americas. His official title will be “Saint Oscar Arnulfo Romero, Bishop and Martyr,” although for many he is already “Saint Romero of the Americas”. Exactly four months to the canonization of Blessed Oscar A. Romero, bishop and martyr, alongside 5 other blesseds, in Rome, on October 14, 2018, this is the second of several notes that I post about going to Rome for the canonizations—or to be part of the event though some other type of participation. In the first installment, I wrote about the general possibilities for participating in the canonization: going to Rome to witness the ceremony in person or participating from El Salvador, for the many Salvadorans who cannot make the trip. Now I want to touch on two aspects that were implied in the foregoing but not explicitly addressed: (1) participation by the Salvadoran diaspora in the pilgrimage to Rome; and (2) the possibility of making a pilgrimage to the land of the saint, as an alternative, especially for Americans not of Salvadoran descent. At the beginning of this week, Archbishop Vincenzo Paglia, the postulator of the Romero canonization cause, recorded a video inviting Salvadorans to attend the canonization October 14ceremony in Rome, during which Romero will become the first Salvadoran to be raised to the altars as “Saint Romero of the World.” Unfortunately, the vast majority of Salvadorans have no way to heed this call, however much they would like to, for want of financial means. However, many Salvadorans residing in the United States have sufficient income to pay for the trip, and they should be taken into account in efforts to attract a Salvadoran presence to the ceremony. In reality, a community that started as a band of war refugees has realized important achievements: 14% of them have salaries that place them in the top 25% of US household incomes (more than $90,000 per year); 4% with salaries in the top 10% (more than $120,000). With impressive concentrations in Los Angeles, New York and Washington, among other cities, it would be possible to conduct targeted campaigns, to urge them to take part in the historic process and challenge negative stereotypes regarding the people of Saint Romero. The emphasis could be a return to, and reassertion of, their identity, from their exodus. On another note, we must also recognize that many Americans admire Archbishop Romero and, even though they may want to go to the canonization, perhaps a trip to Rome is out of reach. For them, we can propose the idea of ​​making a pilgrimage to El Salvador, which has been a Romero pilgrimage destination years running. One option is to go to El Salvador and live the canonization with the Salvadoran people. But, the idea of ​​witnessing the precise moment of the canonization in El Salvador may not be very attractive, since it will be 2 am in El Salvador when it happens and, perhaps, if we are going to watch the ceremony on a television screen (as the Salvadorans will do in the same square where Romero was beatified), we might prefer to do so from the comfort of our own home. That is why there is another alternative, which is to go in August, not for the canonization, but for the pilgrimage to Ciudad Barrios, where Romero was born in 1917, for the second pilgrimage walk “to the cradle of the saint”. Scheduled for August, beginning on August 2 and ending on August 4, this event will initiate preparatory activities for the canonization among Salvadorans. It is already being projected as the Salvadoran version of “the Way of Compostella” (the great pilgrimage route in Spain). Apart from seeing the small town where Romero was born, it also offers the possibility of seeing the east of the country, including panoramas dominated by two volcanoes (San Vicente and San Miguel), and places associated with other Salvadoran martyrs. The emphasis would be to accompany the Salvadoran people, visiting the sacred sites of Romero’s country. Exactamente cuatro meses de la canonización del Beato Oscar Arnulfo Romero, obispo y mártir, junto con 5 beatos más, en Roma, el 14 de octubre 2018, esta es la segunda de varias notas que pienso subir sobre viajar a Roma para las canonizaciones—o de ser parte del evento por otro tipo de participación. En mi primera entrega, escribí sobre dos posibilidades generales para participar en la canonización: ir a Roma a presenciar la ceremonia en persona o participar desde El Salvador, para los numerosos salvadoreños que no pueden hacer el viaje. Ahora quisiera reconocer dos aspectos implicados en lo anteriormente expuesto pero no definidos explícitamente: (1) la participación por parte de la diáspora salvadoreña en la peregrinación a Roma; y (2) la posibilidad de peregrinar a la tierra del santo, como una opción alternativa, especialmente para los estadounidenses no salvadoreños. Al principio de esta semana, Mons. Vincenzo Paglia, el postulador de la causa de canonización de Mons. Romero, grabó un video invitando a los salvadoreños a acudir a la ceremonia de canonización en Roma el 14 de octubre, en cual Romero se convertirá en el primer salvadoreño en ser reconocido como santo, “San Romero del Mundo”. Desgraciadamente, las grandes mayorías salvadoreñas no tienen posibilidades de acatar ese llamado, por mucho que desearían hacerlo, por falta de recursos económicos. Sin embargo, muchos de los salvadoreños que residen en Estados Unidos sí tienen ingresos suficientes para costear el viaje, y se les debería tomar en cuenta en los esfuerzos para atraer una presencia salvadoreña a la ceremonia. Según un estudio sobre la diáspora salvadoreña, la población de migrantes originarios de El Salvador y sus familias en Estados Unidos es de 2.1 millones, entre quienes la participación en la fuerza laboral supera la de la población general (75% de salvadoreños en EE.UU vs. 64% de la población estadunidense en general). Sin duda, es una populación con muchos limitantes, incluyendo falta de documentos en muchos casos, pero representa un grupo importante de tomar en cuenta—lejos de las brutales caracterizaciones del ocupante de la Casa Blanca, que los quiere pintar como criminales y originarios de un “agujero de m---”. En realidad, una comunidad que empezó como un bando de refugiados de guerra ha alcanzado logros importantes: 14% de ellos cuentan con salarios que los coloca en el top 25% de ingresos familiares de EE.UU (o sea más de $90,000 anuales); 4% con salarios en el top 10% (o sea más de $120,000). Con concentraciones imponentes en Los Ángeles, Nueva York y Washington, entre otras ciudades, sería posible hacer campañas dirigidas, para exhortarles a tomar parte del histórico proceso y desafiar los estereotipos negativos sobre la gente de San Romero. El énfasis podría ser un retorno a, y reafirmación de, su identidad, desde el éxodo. Por otro lado, también debemos reconocer que muchos norteamericanos son admiradores de Mons. Romero y, aunque quisieran ir a la canonización, quizá un viaje a Roma les resulte afuera de su alcance. Para ellos, podemos proponer la idea de hacer un peregrinaje a El Salvador, lugar que ha sido destino de peregrinación romeriana por varios años. Una posibilidad sería ir a El Salvador y vivir el momento a la par del pueblo salvadoreño. Sin embargo, talvez la idea de presenciar el momento preciso de la canonización en El Salvador no sea muy atractivo, ya que va a suceder cuando sean las 2 am en El Salvador y quizá, si vamos a ver la ceremonia en pantallas televisivas (como lo harán los salvadoreños en la misma plaza donde Romero fue beatificado), mejor preferiríamos hacerlo en la comodidad de nuestra propia casa. Por eso existe otra alternativa, que es viajar en agosto, no para la canonización en Roma, sino para la peregrinación a Ciudad Barrios, donde nació Romero en 1917, para la segunda caminata en peregrinación “a la cuna del santo”. Programado para mediados de agosto, empezando por eso del 2 de agosto y culminando el 4 de agosto, este evento iniciará las actividades preparativas para la canonización entre los salvadoreños. Ya está siendo proyectado como la versión salvadoreña de la ruta de Compostela (la gran peregrinación de España). Aparte de conocer el pueblito donde nació Romero, también ofrece la posibilidad de conocer el oriente del país, incluyendo los panoramas dominados por dos volcanes (San Vicente y San Miguel), y los lugares asociados con otros mártires salvadoreños. El énfasis sería acompañar al pueblo salvadoreño, visitando los sitios sagrados del país de Romero.